Thanks again for the conversation, we were impressed with your entire team & were happy to meet you. Nicole, Jeremy, Anders, Heidi, Hannah and Kevin did a nice job in making us feel valued as a customer.....what more could we ask for? Their communication was timely and they respected our time and displayed great respect for our needs. 2019 Travato GL purchased from Lichtsinn RV three months ago. Experience was wonderful. I was given Nicole Follman as my sales person. She was great. I had researched for months. Nicole talked with me many times and was willing to spend as much time as I needed every time. Decision made. Flew up from Alabama and Lichtsinn had a driver pick me up at my hotel. Friday viewed unit and orientation. Great experience. Stayed weekend on lot to learn how the Travato GL worked. Monday parts and service helped me all day and a few problems from factory fixed. AFTER THE SALE. Now three months later... I have called Lichtsinn RV many times since this and asked for parts, service, and Nicole Follman. Every time, every department has answered and helped me, answered my questions, given advice and spent as much time as I needed on the phone. Since then I have received emails and phone calls from Nicole Follman. Even a few just seeing how things were going with me and my Travato. I was given a whole team to work with when I was ready to purchase my RV. They all have to be rated 10 out of 10. Up front pricing, no surprises, best deal overall, exact model I had picked out. While I was there I watched customers come and go,sales service, parts and everyone was given undivided attention and people came for service from many different states and talked to me about all there good service visits and most had purchased before from Lichtsinn RV. Love my new RV and great memories with Lichtsinn and Nicole Follman. The Lichtsinn RV team was and still are great. I have called them and asked more questions and got great results. I found out I didn't get a tire hazard plan and Brandon got one for me late on a Friday afternoon. Justin called me back on a question I had. Ron Lichtsinn even spent a half hour answering questions helping me with my flat towed vehicle. Six stars for a extra great job. See you this summer. We could not be more pleased with the purchase of our new Vista from Nicole Follman and the rest of the Lichtsinn team. Everyone was a pleasure to work with. We had a lot of requirements and they met them all! We added a lot of aftermarket items, from multiple lithium batteries to mega solar panels to what we refer to as our DirecTV droid satellite dish and then some. It all works flawlessly. We read lots of reviews and watched lots of Ron Lichtsinn videos (multiple times) and thought it would be worth it to travel from Arizona to Iowa to buy our rig. Great decision on our part! Buying across state lines was a piece of cake! If you are concerned about that, don’t be. These folks know what they’re doing. Picked us up at the airport, gave us a car to drive while we were in town, even did some last minute additions the day before departure. Trust us, fly to Iowa and buy from Lichtsinn. #1,Best deal we could find, and worth driving the 2000 mi from California for. What was the decisive factor was there honesty and trust that I felt dealing with them. Reed and the rest of the staff became instant friends! Wish we lived closer! We felt fully confident on their preparing us and any follow up we may have. By the way first time we’ve ever had a MH ( our 4th ) prepared so so well. We have no issues! Thanks to all the staff hope to make our rounds again. Special thanks to Reed and Kevin. Everything we experiences today was over and beyond any camper purchase we’ve made! Just picked up our new vehicle from Lichtsinn. Came all the way from California and it was worth it. Professional, knowledgeable, and incredibly nice staff. Big thank you to Jeremy, Nicole, Brandon and the rest of the staff. Great experience! Wow, what can I say!? 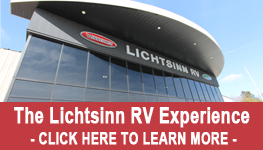 Super thrilled to be part of the Winnebago and Lichtsinn RV family! The initial contact, continued support, and friendly banter of Nicole made the buying experience a thrill! The attention to detail and follow-through provided by Kevin during the sometimes daunting financial process made it manageable and easy. The comprehensive orientation offered by Brad was super informative and his patience put me at ease as I asked many questions. Rhonda’s photography skills captured my good side, and brief, yet thoughtful introductions by Hannah, Justin, and the man himself, Ron, sealed the deal! THANK YOU Lichtsinn RV for making the drive from Ohio worth every penny! What a great team to work with! From Nicole Blaser to Ben, Justin, Brandon, Ron and the rest of the Lichtsinn staff. So friendly and accommodating. This has been our best vehicle buying experience ever. Thank you! We are now loyal customers. We have just realized my lifelong dream of purchasing a travel buggy! As first time buyers, I felt safe and secure with our decision to put our trust in Lichtsinn. All staff we interacted with were helpful and knowledgable. It was no surprise the place was hopping! HUGE shout out to Brandon, the finance guy, he is simply brilliant, therefore relieving the pain of the arduous task of 'signing the papers'. The most interesting experience however, was in the waiting area where 3 groups of travelers were waiting for various warranty/repair services to be done on their vehicles. One of the couples had traveled 800 miles from LOVELAND, CO because Lichtsinn is the BEST dealer in the USA - and they were well seasoned and had visited all sea to shining seas. Without a doubt, that says is ALL.